This entry was posted on September 25, 2018 by Beckie. For residents in care homes who don’t have the cognitive function to know when they might be at risk, getting out of bed or up from a chair can be potentially dangerous. Sensor equipment is increasingly being used to alert carers when someone with dementia or reduced cognitive function could be at risk when moving around. • Trip hazard – trailing wires also can cause trip hazards and increasingly Occupational Therapists advise against this type of equipment for this reason. • Unsuitable for some people living with a Dementia as they see it as a ‘black hole’ and step around it, rendering it useless. So what can Hcsuk offer you that’s new, innovative and unique? Our ground-breaking Airlert system has been perfected over many years so we thought we'd tell you a bit more about why we think it's so great! 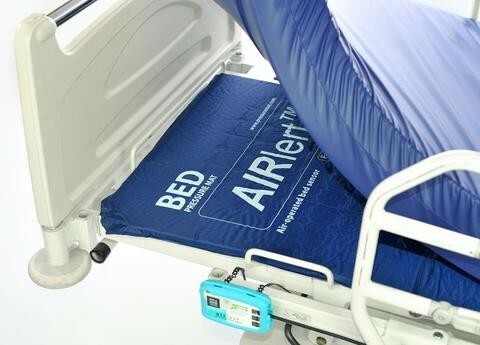 Airlert systems measure air pressure to detect someone getting out of a bed or chair, which is more difficult that you might initially think. Unlike conventional methods this provides a far more reliable and unobtrusive way of monitoring. We are now busier than ever and our Airlert system is increasingly becoming the go-to sensor for hospitals, care homes and home carers. The system works with all bed types, airflow pressure relieving mattresses and profiling beds. We currently have 3 trials underway in dementia wards in different NHS trusts, working in conjunction with OT's, Physiotherapists and Falls Prevention Teams to update their equipment and reduce their incidents of falls. The Airlert mat is made of thin foam layers covered with a waterproof, durable nylon. There are no electronics inside the mat so all the lumpy, sensitive bits are kept out the way in the sensor control box. This box runs for up to 5 years on two AA batteries and is connected to the mat via a simple air tube. We work in partnership with a technology company who are constantly developing and improving their products and have been working closely with several local authorities and after extensive research we will soon be launching our advanced bed system that detects vital signs and can connect to call system timers including Tunstall's Tims box and the Tunstall Universal box. We have received such great feedback about our Airlert On Bed and On Chair systems and we are sooo confident that you will love them too, that we are offering you the opportunity to trial one, free of charge and with no obligation, for 30 days. SO, don’t delay, call us today on 01773 713713 or email us at [email protected] to arrange your FREE 30 DAY TRIAL and to reserve your copy of our brand new Holistic Guide to Falls Prevention in Care Homes.